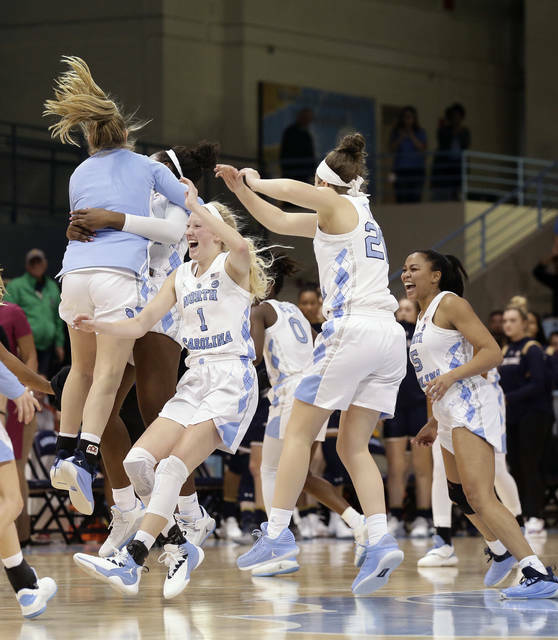 NEW YORK (AP) — North Carolina joined a somewhat exclusive group on Sunday with the Tar Heels’ win over No. 1 Notre Dame. They are just the fourth unranked team to beat the top squad in the AP poll over the past 20 years according to ESPN. All four of those upsets have come on the road in conference play. The other two times were Baylor losing at Texas Tech in 2011 and Tennessee falling at Kentucky in 2006. “If it was a non-conference game, then I would be a little more surprised. 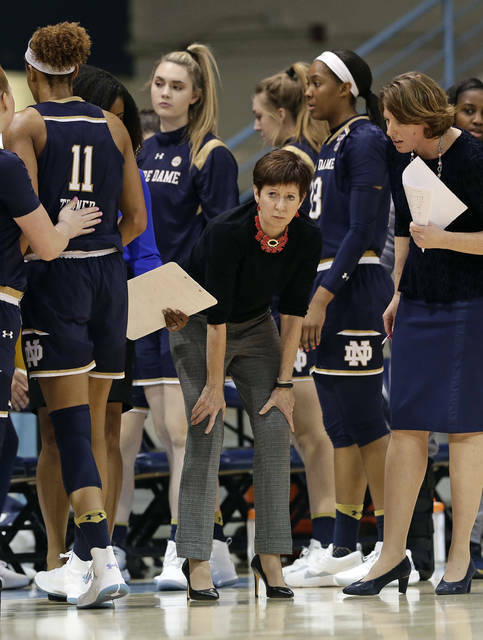 But the fact that it’s a conference game, they’ve seen Notre Dame a lot the last couple of years,” Auriemma continued. No. 1 teams had won 198 straight games against unranked opponents according to ESPN. North Carolina beat a No. 1 team for the third time in program history and first since topping Duke in 2006. MENTAL HEALTH AWARENESS: Duke hosted a “Mental Wealth Day” on Sunday and former Tennessee and WNBA star Chamique Holdsclaw served as the keynote speaker for a pregame discussion about mental health issues. Blue Devils coach Joanne P. McCallie attended the funeral of an ex-teammate’s daughter who died by suicide when she knew she had to do something. “I think everybody needs to be in a place where they can feel like they can get help without a stigma attached,” McCallie said Saturday. The women’s basketball program partnered with the NBA, the university’s counseling services department and the Jed Foundation, a nonprofit that works with colleges and high schools on suicide prevention, to hold the event. McCallie came up with the idea while consulting with her staff members, Dr. Danielle Oakley of the university’s counseling department, and Shawn Zeplin, Duke’s director of behavioral health, upon her return from that funeral last summer. McCallie’s goal is threefold — “awareness, education and an openness,” she said — and added that one key was the inclusion of Holdsclaw. TIP-INS: New Mexico’s Jaisa Nunn became the 14th player in league history to score 1,000 points and grab 800 rebounds, reaching the mark on Wednesday. She’s the third student-athlete in school history to accomplish the feat. … The Wyoming Cowgirls defeated Boise State on Saturday to halt the Broncos 10-game win streak and secure head coach Joe Legerski’s No. 300 career win. … Alabama won at Georgia for the first time since 1997 on Sunday. The 58-53 victory was only the fourth time it’s happened in school history and snapped a 12-game road losing skid against the Lady Bulldogs. … Villanova’s Mary Gedaka has hit 26 of her last 30 shots from the field over her last three games and had back-to-back 20-point games this weekend in wins over Seton Hall and St. John’s. She only missed one of her 11 shots in the win over the Red Storm on Sunday. … Arizona and UCLA played a three OT game on Sunday which the Bruins won 98-93. It was just the second Pac-12 game to reach three OTs since 2001. Arizona was also involved the last time any Pac-12 team went to three OTs, when the Wildcats played Loyola Marymount in 2008. 3-POINT THREAT: N.C. State guard Aislinn Konig briefly held the longest active streak of games with a made 3-pointer earlier this month. She was trailing Central Michigan’s Presley Hudson by three games before Hudson went 0-fror-5 from behind the arc against Miami (Ohio) on Jan. 16. Konig went 5-for-12 from 3-point range during the Wolfpack’s next game, a win over Virginia Tech on Jan. 20, leaving her as the NCAA D1 player with the longest active streak. Konig’s streak came to an end at 51 games when she missed all seven of her shots from behind the arc on Thursday against Clemson. In the later stages of the streak, Konig would follow Hudson’s progress while also keeping an eye on the longest streak ever recorded, which is Kelsey Mitchell’s streak of 92 games while at Ohio State. THREE-WOMAN GAME: In Duke’s loss to Florida State on Jan. 20, three players combined to score all 62 points. It’s the first time this season that’s happened in a game and the first time it’s happened at a major conference school since Utah did it against Washington in 2012 according to STATS. The last time an ACC team did it, was Miami against George Mason in 2004. Duke’s Leaonna Odom, Jade Williams and Haley Gorecki also became the first trio to score over 60 points and have all the team’s points since Milwaukee against Cleveland State in 2009. STREAK BUSTER: Tennessee’s longest losing streak in nearly half a century is finally over. Rennia Davis scored 24 points in a 74-65 victory over LSU on Sunday that ended a six-game skid for the Lady Vols. Tennessee hadn’t lost six straight games since 1970. HONORING ANNE: Old Dominion wore throwback light blue uniforms with former star Anne Donovan’s name on the back in Saturday’s 72-47 victory over Texas-San Antonio. Donovan died on June 13. The Monarchs (15-5) have won six straight and are off to their best mark after 20 games since the 2007-08 season. AP Sports Writers Joedy McCreary, Steve Megargee and Pat Eaton-Robb contributed to this story.